To ensure that your teeth remain healthy and not “scarred” by plaque it is vital that you brush your teeth! When you have braces, it is more important than ever to brush and floss regularly. Food and bacteria that collect around bands, brackets, and wires can cause stains and cavities, not to mention unpleasant odors, so be sure to keep your teeth clean. If plaque remains on the teeth for too long, it will leave a permanent white scar on the surface. Brushing after meals should become part of your daily schedule. Brushing teeth with braces requires more time than brushing without braces. Be prepared to spend at least two minutes each time you brush. Use a soft toothbrush with firm pressure and brush at a 45 degree angle to the tooth; brush in small circles above and below the brackets. Click here for visual instructions. Your toothbrush will wear out faster because of your appliances, so be sure to replace it whenever the bristles start to fray. A waterpik can be a useful addition but it cannot remove the sticky plaque that adheres to the teeth. Ultrasonic toothbrushes, such as the Sonicare are great. Use a tooth brush with a small amount of toothpaste. Brush each surface of your tooth. Use a circular motion around each tooth and gumline. Brush your upper teeth down and your lower teeth up. Also brush your tongue and the roof of your mouth. To help keep your teeth and gums healthy, we also recommend that you see your regular dentist for a professional cleaning every 6 months. Patients who do not keep their teeth clean may require more frequent visits. Adult patients who have a history of gum disease should also see a periodontist during orthodontic treatment. You should brush your teeth at least three times a day (after breakfast, after lunch or immediately when you arrive home at the end of the day, and before bedtime). In addition, we recommend a daily fluoride rinse (Phos-Flur®) to minimize the chance of decalcification (permanent white spots on the teeth in areas where plaque is not removed) or cavities. Other aids, such as an electric toothbrush (Sonicare®), Waterpik®, and small interdental (or proxa-) brushes should also be considered. We also recommend that you use a Proxabrush to clean difficult-to-reach areas around your wires, brackets, and bands. 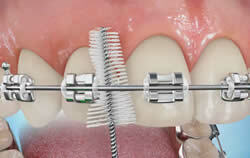 These brushes are especially helpful to remove food and plaque along the sides of the braces. Flossing is an important part of keeping your teeth healthy! Flossing removes the food in between your teeth and prevents interproximal decay (decay inbetween the teeth). Flossing is important and should be done everyday. Flossthreaders will help you get the floss in between and under the braces. The floss threaders are reusable. When you have braces, you should floss once a day. Flossing with braces is easier with the help of a floss threader or using SuperFloss®. Start by threading the floss under the archwire. Using a small section of floss, wrap one end around your left and the other end around your right index finger, and gently slide the floss between two teeth toward your gums. Wrap the floss tightly around the tooth on left side and move the floss up and down several times, making sure that the floss reaches the gumline. Wrap the floss around the tooth on the right side and do the same. Repeat these steps at all contact points between your teeth.